You are given two squares A and B. 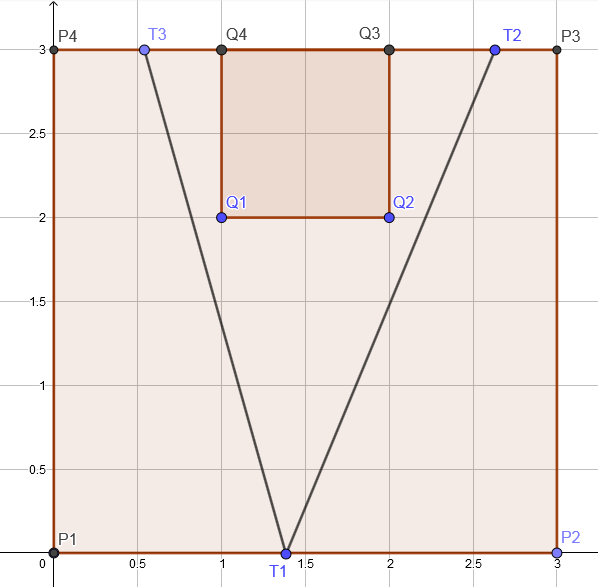 The square A has a side length of $a$ and B has a side length of $b$. 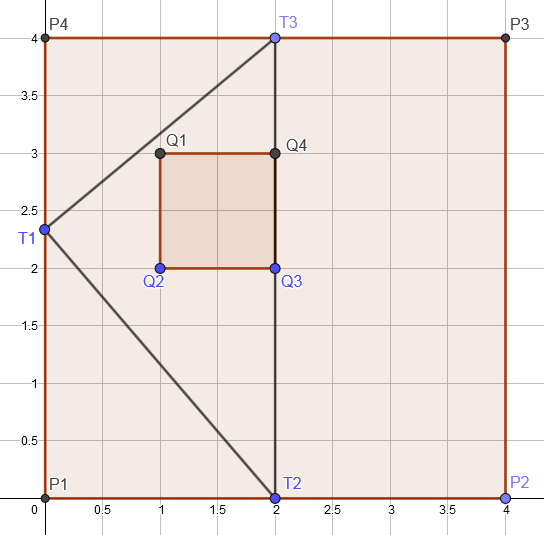 The left-bottom point of square A is at $(0, 0)$ and the top-right at $(a, a)$. Square B's left-bottom point is $(x, y)$ and top-right is $(x + b, y + b)$. It's guaranteed that square B lies inside square A (may not be strictly inside, can touch too). In other words, $0 \leq x, 0 \leq y, (x + b \leq a, y + b \leq a)$. You have to tell whether you can construct a triangle T such that - All the vertices of the triangle lie on the boundary of square A. - One of its sides is parallel to one of the sides of the square A and this side should contain one of the sides of square B as a subsegment. That is, there should be a side of the triangle, say $T_2T_3$, which is parallel to one of the sides of square A, and which contains a side of square B, say $Q_3Q_4$. That is, the line segment $Q_3Q_4$ should lie within the line segment $T_2T_3$. - Square B is inside the triangle T (is allowed to touch the sides of T, but shouldn’t go outside the triangle T) ### Input - The first line of the input contains an integer $T$ denoting the number of test cases. The description of the test cases follows. - The first line of each test case contains four space-separated integers $a, b, x, y$. ### Output For each test case, print a single line containing the string `yes` if it is possible to construct such a triangle, or `no` if it is impossible. ###Constraints - $1 \le T \le 10^5$ - $1 \le b \leq a \le 10000$ - $0 \le x, y \le a - b$ ### Example Input ``` 4 4 1 1 2 3 1 1 2 3 1 0 0 3 2 1 1 ``` ### Example Output ``` yes yes yes no ``` ###Explanation **Testcase 1**: The following figure shows one possible way in which the triangle can be constructed: ! [Testcase 2](https://codechef_shared.s3.amazonaws.com/download/Images/TST18KGP/SQRTRI... =475x475) Square A is P1 P2 P3 P4, square B is Q1 Q2 Q3 Q4 and the constructed triangle T is T1 T2 T3. **Testcase 2**: The following figure shows one possible way in which the triangle can be constructed: ! [Testcase 2](https://codechef_shared.s3.amazonaws.com/download/Images/TST18KGP/SQRTRI... =475x475) Square A is P1 P2 P3 P4, square B is Q1 Q2 Q3 Q4 and the constructed triangle T is T1 T2 T3.